(in one short-lived but vividly remembered comic book) Ronald Reagan, he is a head of state who somehow finds time to maintain an active presence in the superhero community. The black get-up he covers his entire body with supposedly has to do with his status as king of Wakanda, a small but technologically advanced nation in Africa, but we know a superhero suit when we see one. And by the way, he bore absolutely no relation to the one-appearance wonder of that name, published by Centaur (Speed Centaur, The Arrow) in 1941. 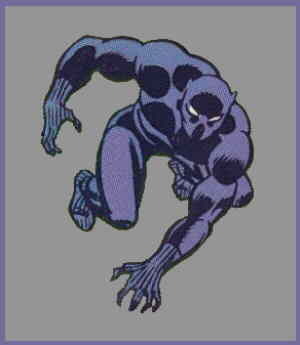 This Panther was created by writer Stan Lee and artist Jack Kirby, the legendary team behind practically every 1960s Marvel series from X-Men to Sgt. Fury & His Howling Commandos. They first used him as an antagonist for The Fantastic Four, in Fantastic Four #52 (July, 1966), but made it clear even then that he was intended to be more than a two-bit villain. In fact, he was the first black superhero to achieve even modest success. Within a couple of years, he was a member of The Avengers, which Marvel was using partly as a parking place for characters they might want to use more prominently later on. At first, his reason for hanging out with an American outfit was to spy on them, but later even that threadbare excuse for neglecting his royal duties was dropped. He was equipped with the usual super powers — abnormal strength, agility, sense acuity, etc., plus an uncanny ability to track his quarry across any terrain. (They usually give that one to indigenous superheroes in regions that have been heavily colonized by Europeans.) These powers, like those of Elongated Man and Atomic Mouse, came from ingesting a substance which was never, ever referred to as a drug. Also, his ancient, traditional garb has been technologically fortified to the point where stopping bullets is the least of its virtues. The Panther first got a series of his own in 1973, when Marvel made him the star of Jungle Action, a title that had formerly consisted entirely of reprints from the 1950s. There, his adventures were written by Don McGregor (Killraven, Detectives Inc.), who brought him back to Wakanda. Not surprisingly, he'd gone way down in the polls during his long absence, which in the superhero world usually leads sooner or later to a physical confrontation with a rival for power. This theme has been repeated a couple of times since. McGregor's series ended in 1976, but was followed almost immediately by a Black Panther title written and drawn by Kirby. Kirby's series ran until 1979, after which The Black Panther kept his trademark current mostly through guest appearances, with the occasional mini-series thrown in. McGregor returned to write him a couple of times, and came to be considered by many as the definitive Black Panther writer — until 1998, at least, when a new ongoing series began, scripted by Christopher Priest (The Falcon, Power Man/Iron Fist). That one ran for years, and was in fact one of the more popular series Marvel had going. Which proves it pays to keep a minor character's trademark current, no matter how little star potential he seems to have. Text ©2002-07 Donald D. Markstein. Art © Marvel Comics.